Broccoli Custards, Thyme for Cooking gourmet first course. 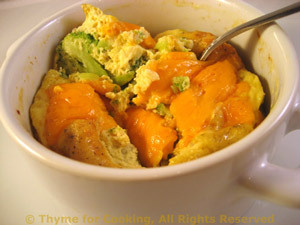 A mini Broccoli Casserole. Serve from the ramekin to keep it piping hot. Use just enough broccoli florets to lay snug but flat in the bottom of the ramekins, coming about half-way to the top. Heat water in a medium saucepan. Trim broccoli, making small florets to fit into the ramekins. When the water is boiling, add the broccoli and blanch for 6 minutes. Drain and immediately rinse well with cold water. Arrange the broccoli florets snugly in the bottom of the ramekins. In a small bowl whisk the egg, milk and thyme. Pour over broccoli, dividing equally. Slice the cheese to fit and lay on top. Bake, 375F (180C) for 25 minutes. Remove and serve. Note: I put the ramekins on a baking sheet for easier handling.